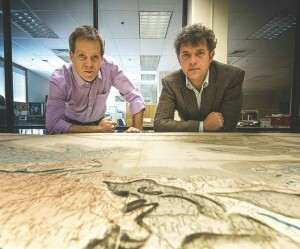 Professors Robert Gaines and Jade Star Lackey examine the restored map. So it’s something of a feather in the cap of Pomona’s Geology Department that it is the proud owner of not one, but two of the historic maps. And with the bicentennial of the map’s release last year, one of them was brought out of safekeeping in the Special Collections of Honnold-Mudd Library to be restored. Because of the map’s size (more than two and a half meters wide), the restorers had to set up an aluminum platform over the top of the map to work from. Even so, the conservation process took nearly two months, including dry cleaning front and back, removal of a damaged cloth backing, wet cleaning, lining with Japanese paper and wheat starch paste, and mending tears. The result is impressive to behold, not just for the brilliant and colorful detail in drawing and watercolor, but also for the rich history and monumental shift it caused in the field of geology.